﻿"Sorry sir, I’ve never heard of SIMULATED SWITCHES or VIRTUAL SWITCHES before. Do you mean you don’t actually have the switches in your house with you???" The old switches I ﻿had, sometimes working sometimes not and the alexa APP says they are not responsive. ﻿- Disable and enable Smartthings skill in alexa app. ﻿- Delete and recreate Sim Switches in SmartThinds IDE. 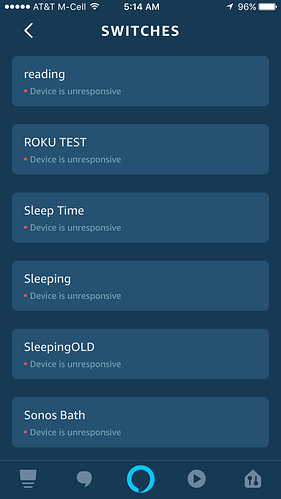 ﻿- Tried an app written by M. Struck that creates virtual switches for alexa. It did create the switch and in Smartthings app it works. And it shows it is connected to alexa but in alexa app it’s no where to be found. Anybody else is having problems discovering simulated switches or using them in alexa??? Are they declearing a war to WebCore??? Ps : I am already trying all the websites I ﻿know, I ﻿hope someone can point me to a direction for the answers. Log out of the Alexa app and back in, have you tried that? If I’m understanding this correctly, webcore is not seeing the virtual switches that you created? No no I have no problem with webcore. The only reason I am asking the question here is, most webcore users depend on simulated switches. 1 - Alexa is not seeing the new simulated switches. 2 - All of the old switches i created look OFFLINE now in alexa app. But they all work really well if controlled via ST app or ActionTiles. Voice controls are GONE… no longer working. Check the device type you used because there used to be only one type of virtual switch, now there’s another version in the drop down list. Might want to check that also if it has any impact on what you’re trying to do. I’ll check that right now. Tried bunch of different switches (Virtual etc) bu no luck. Other than that my current switches (in alexa app & routines) stopped working with voice command. Alexa pretends it’s happening but nothing inside the house happens. It takes her about 20 seconds to run, but she activily searches out devices to (re)connect to, After the discovery, you may have to wait a few until the app updates, but vocal commands should work immediately. I have had 100% success with “Simulated Switches” created from the IDE, both in webCoRE & Alexa. Your mileage may vary, but I have often incountered problems when using “Virtual Switches”. Normally that exactly how it works. But about a week ago I was no longer able to add any new sim switches. I see them in ST IDE. I see them in WebCore. I see them in ActionTiles. I cannot add them to alexa. the picture is just an example of over 200 devices. I thought maybe too many switches and started deleting some (the ones that no loner in use). Could you do me a favor and add a new Sim switch to your system IDE and test it to see if alexa can find it! ??? i’ve been researching the internet and the only case I saw is back in 2017. Apperantly no one is experiencing this currently. I was able to replicate the issue. After a bit of reading and testing, I found a easy solution. 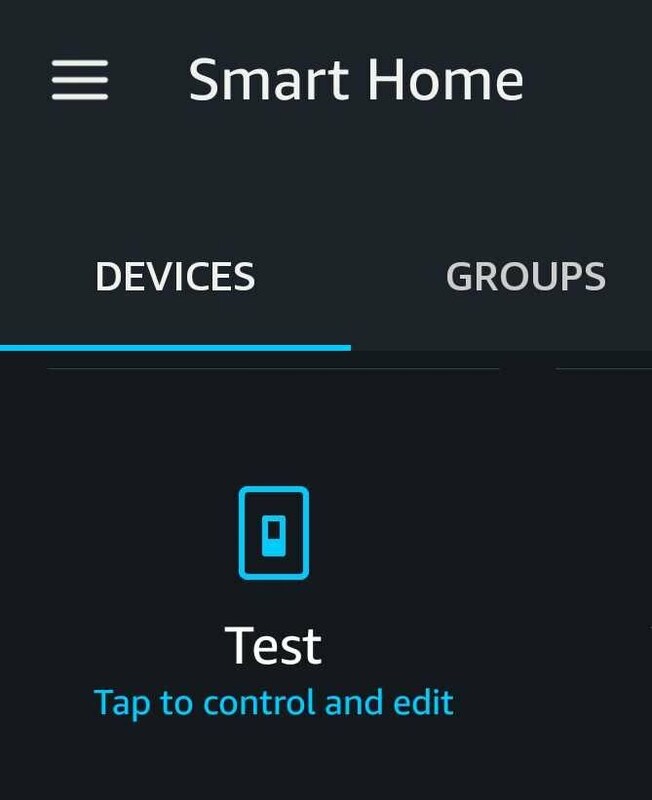 All my old devices & the new test SimSwitch are available for voice commands, and visible in the Alexa app! I got really excited when I see that you replicated the same problem… but the solution did not work. I waited about 30 minutes before enabling the skill. I have about 267 items in alexa (Everything) could there be any limit to devices??? My research indicates that that may be best. ST made a change, and it has impacted some people. No what I have is 2 Ph Hue hubs. Probably it will be fixed soon. Not even my sonos speakers. The only discovery is from PH HUE hub. Light bulbs and some wi-fi or alexa certified plugs that are not zwave plugs. So I would say at this point my alexa is not seeing my ST hub. My house is like, as if I don’t use a ST HUB. Tech support is never as fast as we’d like them to be, LOL But I must say, good observations! My first hunch would be to go into ST and disconnect from Alexa… Reboot / wait etc… then connect a “new” device in ST, and point it to the Alexa account, hopefully reauthorizing again in the process. But I have not tried adding an actual device - like a smart outlet, wall dimmer etc - I’ve been testing with virtual stuff. Tomorrow I’ll try some outlets and see where that goes. I wish I knew if this was Amazon or Samsung problem? This makes me think it is not related to SimSwitches, but your idea for testing cannot hurt. I think it is the opposite of this… What I mean is, I think that ST that cannot see Alexa. Did it prompt for an authorization in the process? Thanks for the update. Glad you got it working! !